Over the past twenty-five years Dr. Johnston has taught self-help skills to thousands of people in settings ranging from hospitals and clinics to community groups and churches. He is a frequent guest on local television and has had his own weekly show on 13WMAZ in Macon, Georgia. Dr. Johnston has developed the popular Awakenings Web site and offers information on psychological health to tens of thousands of worldwide visitors each year. He is a columnist for the Macon Telegraph newspaper. Click below to buy the ebook. We live in a time of rapidly escalating change. The world is in flux, and safe harbors of stability are increasingly hard to find. Our abilities for coping with ever-changing situations are severely challenged. Constant change is now the norm, and we are in need of Change-Ability: the ability to design, implement, and follow through with effective strategies of change management. Change-Ability depends on three areas of knowledge. Dont just try to survive. 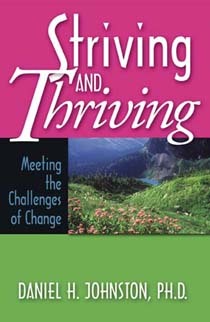 Thrive and thrive with the challenges of change.